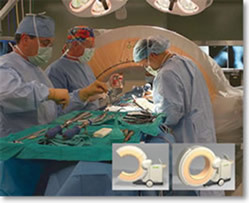 Combining minimally invasive techniques with advanced intra-operative computerized imaging technologies such, as the O-Arm® improves procedure times and patients outcomes. During surgery, the devise encircles the operating table and provides 3-dimensional images so surgeons can track alignment of the spine and placement of implant hardware. The O-Arm provides the ability to make adjustments at the time of surgery thus improving accuracy and patient outcomes. SONSA neurosurgeons utilize O-Arm technology at Rogue Valley Medical Center.